I've said it before and I'll say it again: Makoto Shinkai is the Green Day of anime. I used to make this half-joking comparison between the newcomer anime director and '90s punk revival band since both of them make "the same great song over and over." But little did I know that Shinkai's newest film would fulfill the other part of the Green Day prophecy: the moment they stop making the same song, everybody gets angry that they stopped. Hoshi o Ou Kodomo (localized as the comically verbose subtitle, "Children Who Chase Lost Voices From Deep Below") is just that moment — Shinkai's American Idiot, if you will. It is a distinct break from his typical teen angst stories and a foray into magical action-adventure. The transition isn't too smooth, either for viewers or the director himself, but Children — the fourth film in Shinkai's catalog — is still a beautiful work, and one that hopefully heralds a new period in his career. 12-year-old Asuna is living alone with her workaholic mother following her father's untimely death, but despite a healthy school life she spends most of her time up on the nearby mountain, listening to whatever radio signals she can pick out on her crude ham radio. 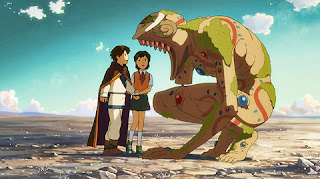 However, a dangerous run-in with a giant monster in the woods results in a friendship with a mysterious boy named Shun. Thus begins Asuna's adventure into the ruined underground world of Agartha. You might already be sensing a bit of an influence here, and no, you're not mistaken. 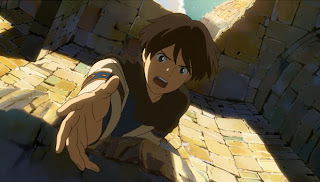 Makoto Shinkai has openly expressed his admiration for the works of Studio Ghilbi, particularly Laputa (Castle in the Sky), which made a big impression on him when he saw it as a boy. And while imitation is the sincerest form of flattery, Shinkai — almost certainly accidentally — leaves the realm of homage and heads straight into the no-man's land of full-on copying. Oh look, there's the Forest King from Princess Mononoke, the cave shelter from Grave of the Fireflies, the fox-squirrel from Nausicaa, the architectural style of Castle in the Sky! Shinkai's touch is definitely there, and one need only pay attention to the director's masterful use of watercolor-esque lighting and color to understand that this is not straight-up imitation, but I still feel like there's a little bit too much Miyazaki and not enough Shinkai in the film. His trademark brooding, silent moments are still there, but they are interspersed with action scenes and fast-paced plot developments. And boy oh boy, those action scenes! I was sure surprised to find that a director whose last outing was characterized by long stretches of waiting silently on a train can create such lightning-fast, exciting action sequences. The film's moments of gunfire and hand-to-hand combat have a sort of whipping speed and kineticism that I've seen only in some of the best action anime directors (and of course, Mr. Miyazaki). Shinkai claims his team studied both Ghilbi movies and the Rurouni Kenshin anime in order to figure out how to animate the scenes. 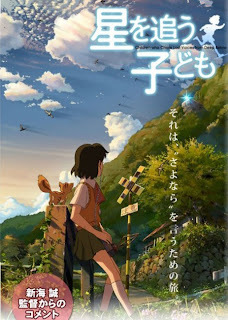 Children hits all the emotional points that you might expect from the director of Voices of a Distant Star, The Place Promised in Our Early Days, and 5 Centimeters Per Second, but one too many deus ex machinas and a few too many different set pieces bog down the pacing to what feels like a crawl. Shinkai has got to learn to edit if he's going to attempt another movie in this vein. But let's make this clear: I would love for Shinkai to try another movie like this. It's a distinct break from his previous work, and while it's more of a so-so Ghilbi film than a great Shinkai film, it is enough of a proof of concept to hook me for the rest of his work. As long as he learns from his mistakes and doesn't get stuck in the rut of re-making this exact movie over and over, this director could really go places. He's got emotional expression down better than basically anybody else in the business, and now has proven his mettle in the realm of action scenes. A little bit more editorial oversight will probably do wonders for honing his style. Is he still the Green Day of anime? Yeah, probably. Is he "the next Miyazaki?" That still remains to be seen, but Children is certainly a fine down payment towards the title. This review is based on the Otakon 2011 premiere screening. The reviewer was given a complimentary press pass for the convention.